LG KF700 comes with a good 176MB of internal memory (the Viewty had only 100MB) and of course there is a microSD memory card slot. Again, unlike the Viewty, the memory card slot is on the top of the device so hot-swapping cards is an option. We can also confirm that 8GB microSD cards worked on our retail unit. However, we did notice a huge lag in file browsing (even in the handset memory), once the memory card started to fill up. The KF700 file manager appears as the My stuff item in the menu. It includes separate factory-preset folders for different file content. The KF700 had no problem here reading custom folders off the memory card as some other LG phones. The main functionality of the image gallery remains the same as the one of the Viewty. Browsing images is even faster here. There's a second image gallery accessible only from the camera interface. It's really nice looking and involves much more touch in image browsing. The LG KF700 offers the same MP3 player as the Viewty. You can filter tracks as with any other modern music player - by artist, album, genre, playlist, recently played and few more. The handset itself has a Flight mode, which really makes it an adequate solution as a portable music player. There are still no equalizer settings for you to use to enhance the player sound. The music player skin now changes to match the currently selected interface theme - in the Viewty it always stayed black. LG KF700 turned out quite a gifted musician in our test. Well, we can't overlook the disastrous stereo crosstalk reading. In fact, we cannot think of any other handset to score worse in this area. However, the rest of the numbers are excellent with good dynamic range and noise levels, and distortion well under control. The frequency response is also on the better side of the handsets we've tested. Have in mind that the published readings are only achievable when the volume level is two steps below the maximum. 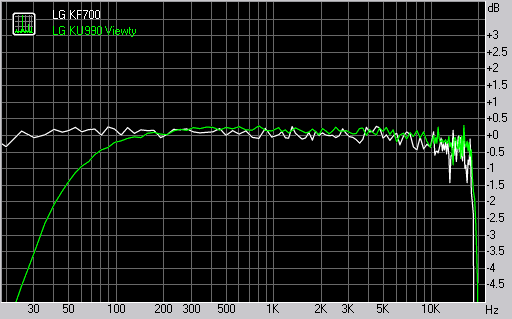 If you go higher than that the audio quality severely suffers due to distortion. Here are the results so you can see for yourselves. You can find more information about the whole testing process here. Naturally, the music player runs in the background problem-free. The same goes for the FM radio, too. As opposed to the Viewty you can now listen to the radio on the handset loudspeaker - that's a basic feature but it was missing in the LG Viewty. The radio stores up to 24 stations - double the amount available in the LG Viewty. However the radio misses the RDS functionality found in the Viewty - you can only enter a radio station ID manually. The video player in LG KF700 is much like the one seen in the Viewty - it is really nice and you can watch videos in fullscreen landscape mode, with or without semi-transparent overlay of player controls. You can also opt for both normal and widescreen aspect ratio. Unfortunately, the DivX playback support has been dropped. YouTube integration is also nowhere founding sight, which is a bummer as you need to rely on the web browser for that purpose and it lacks flash support. So when it comes to YouTube videos, your only option seems the mobile-phone-optimized version of the website found at http://m.youtube.com, which streams the videos in poor quality 3GP format.